An 8 foot pet rock python called Tiny has strangled its owner. Dan Brandon, the British owner of the snake, was found dead in the bedroom of his house in Cookham, Hampshire, England by his mother. The snake was lying close by. 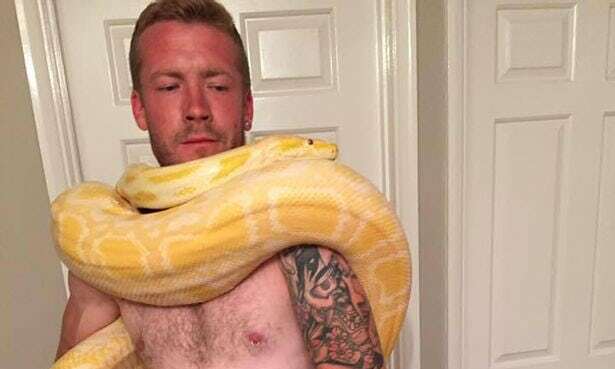 A coroner ruled that Brandon, a lover of exotic pets who kept 10 snakes and 12 tarantulas in his bedroom, had died of asphyxia after his pet had wrapped itself around him and strangled him. But the coroner concluded that he didn’t think that the snake had meant to do it. He believed the snake was not aggressive but had most likely coiled around in a Brandon in an affectionate way and had not realized its own strength. Prof John Cooper, a vet and snake keeper, visited Brandon’s bedroom and examined Tiny. He said he had been impressed by the conditions Brandon kept his snakes in.